A massive Thank you to Farmborough floral art group and all its members who have worked tirelessly to fund raise nearly £900 since the start of the year to purchase us an eye gaze strip to use in sessions! 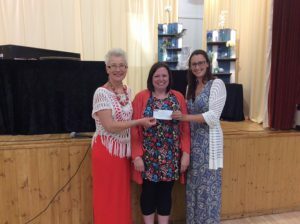 Thank you to Heather and Lara (William and Henry’s mums) who went along to the flower club meeting and were presented with the cheque on 14th May. We look forward to showing you what the eye gaze strip can do and how it will enable children using our service to learn to communicate.